Situation: in the hamlet Pazanici. Access/parking: 3 x parking on the estate. Estate (private use): approx. 2000 m², partially self-contained (fence, wall), in a hillside, trees, meadow. The landlord lives on the neighbouring estate.. Outdoor facilities(private use): terrace (roofed), balcony, furnishing provided, brick barbecue. 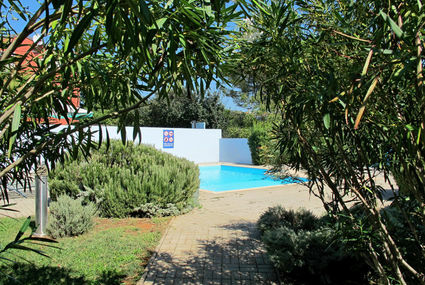 Pool (private use): 8.0 x 3.0 m, 1.50 m deep, open throughout the entire season. Pool area: tiled, 4 deck chairs, sunshades, external shower. Sports facilities/ leisure time: private use (free of charge): billiards, table football, table tennis table, children's playing equipment. ● Distances: Center Pazin in approx. 10 km. Jakacici in approx. 2 km. Zminj in approx. 9 km. Next shopping possibility (Jakacici) in approx. 2 km. Next supermarket (Pazin) in approx. 10 km. Sea in approx. 17 km. Rocky beach in approx. 17 km. Semi-detached house "Entoni". 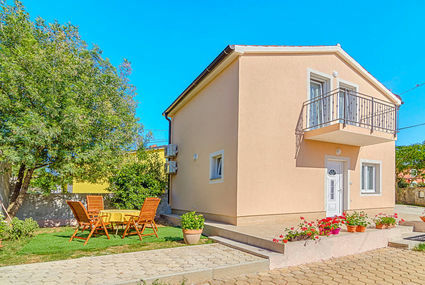 2.5 km from the centre of Vela Luka, in a sunny position, 70 m from the sea, 150 m from the beach. Private: property 1'000 m2 (fenced), swimming pool (4 x 6 m, depth 150 cm, 12.05.-22.09.) with internal staircase. Outdoor shower, terrace (32 m2), garden furniture, barbecue. In the house: internet access, washing machine. Roofed, parking (for 3 cars) at the house on the premises. Shop 2 km, restaurant 1 km, rocky beach, concrete beach 150 m. The unit consists of 2 apartments rented as one unit. 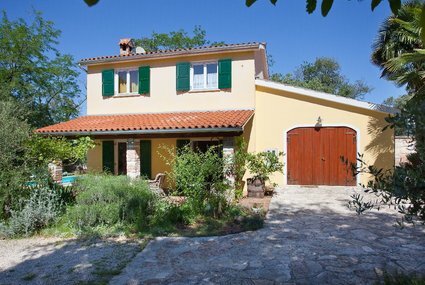 Juricani 5 km from Umag: Beautiful, rustic single-family house "Casa Peronospora", built in 1920, renovated in 2004. 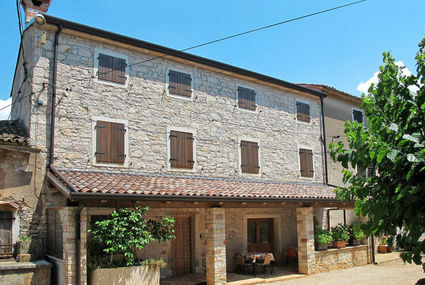 In the hamlet Kranzeti, 2 km from the centre of Juricani, in a quiet, sunny position, 7 km from the sea, in the countryside. For shared use: property 700 m2 with lawn and trees. Private: property 200 m2 with flowers and trees, swimming pool angular (6 x 3 m, 13.05.-07.10.). Terrace, garden furniture, barbecue. In the house: internet access, washing machine. Parking at the house on the premises. Shop 2 km, restaurant 5 km, pebble beach 7 km, rocky beach 7 km. Golf course 20 km, sports centre 7 km. Please note: Property ref. HR2225.200.1 is situated on the same property. Situation: in the district Vala Mala, residential area, holiday village. Access/parking: 4 x parking on the estate. Estate (private use): approx. 450 m², closed plot (fence, wall), meadow, fruit trees. Garden maintenance by the owner 1 time/s per week. Outdoor facilities(private use): balcony 14 m² (roofed), balcony 14 m² (roofed), roof terrace 16 m², furnishing provided, 5 deck chairs, transportable barbecue. ● Distances: Center Valbandon in approx. 100 m. Fazana in approx. 2 km. Pula in approx. 4 km. Next shopping possibility in approx. 20 m. Airport Pula in approx. 12 km. Harbour/marina Pula in approx. 7 km. Sea in approx. 800 m. Rocky beach in approx. 800 m.
Small single-family house "Matea". In the district of Kantrida 6 km from the centre of Rijeka, 7.5 km from the centre of Opatija, in a sunny, elevated position, 400 m from the sea, 400 m from the beach. For shared use: terrace (50 m2), garden furniture, barbecue. In the house: internet access. Parking at the house. Shop 230 m, restaurant, pebble beach, public bathing area 400 m.
Situation: residential area, in the district Valbandon. Estate (shared use with the owner): approx. 200 m², open plot, with plants, meadow, flagged floor. Exterior (private use): Plot description: 2 x parking on the estate. Access to the house via stairs (2 steps). 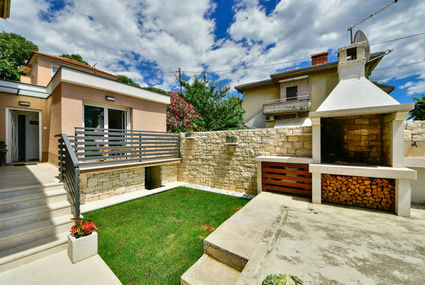 terrace 20 m², balcony 7 m², furnishing provided, sunshade, transportable barbecue. ● Distances: Center Pula in approx. 7 km. Fazana in approx. 2 km. Next supermarket (Fazana) in approx. 2 km. Airport Pula in approx. 11 km. Sea in approx. 1.5 km. Rocky beach in approx. 1.5 km. Situation: in the hamlet Bertosi. Access/parking: gravel road, approx. 50 m. 1 x garage; 3 x parking on the estate. Estate (private use): approx. 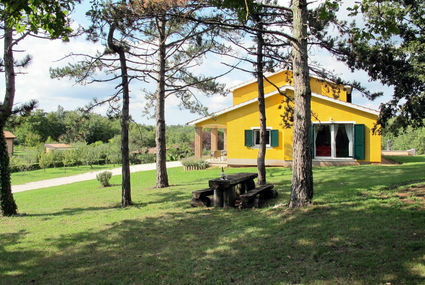 3800 m², open plot, trees, meadow, forest. Outdoor facilities(private use): terrace 30 m² (roofed), further terrace, reserved open space (under trees), furnishing provided, brick barbecue. 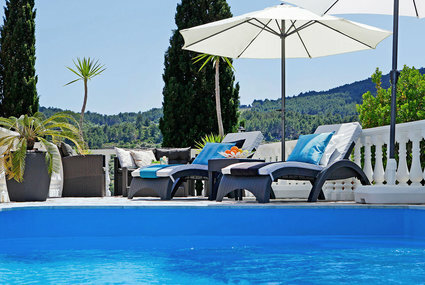 Pool (private use): 7.3 x 3.7 m, 1.50 m deep, open throughout the entire season. Pool area: tiled, 6 sun loungers, 2 sunshades, external shower. Sports facilities/ leisure time: private use (free of charge): football pitch, volleyball. Infrastructure: common room. ● Distances: Center Pazin in approx. 3 km. Zminj in approx. 12 km. Porec in approx. 25 km. Next supermarket (Pazin) in approx. 2 km. . Harbour/marina Porec in approx. 25 km. Sea in approx. 25 km. Rocky beach in approx. 25 km. Situation: residential area, holiday village. Estate (shared use): approx. 2500 m², closed plot (fence), with garden, olive trees. Outdoor facilities(shared use): brick barbecue. Pool (shared use): 10.0 x 8.0 m, 1.50 m deep, 18.05.19-21.09.19. Pool area: tiled, sun loungers, external shower. Wellness: private use (free of charge): outdoor whirlpool (approx. mid May until mid September). Exterior (private use): Plot description: 1 x parking outside the holiday complex; 1 x parking on the road near the house. terrace 30 m² (partially roofed), roof terrace 30 m², furnishing provided, 4 deck chairs, sunshades. ● Distances: Center Novigrad in approx. 800 m. Umag in approx. 13 km. Porec in approx. 15 km. Next supermarket in approx. 500 m. Airport Pula in approx. 75 km. Harbour/marina in approx. 1 km. Sea in approx. 800 m. Rocky beach in approx. 800 m.
Situation: in the hamlet Begi. Access/parking: 1 x parking on the estate; 3 x parking on the road near the house. Estate (private use): approx. 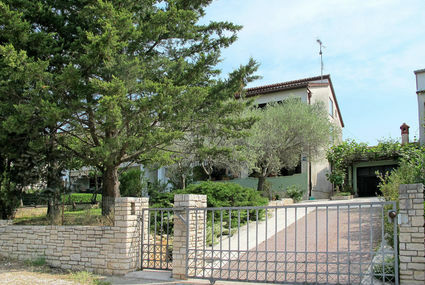 850 m², closed plot (fence, hedge, wall, entrance gate), trees, lawn, olive trees. Outdoor facilities(private use): terrace 12 m² (roofed), balcony 5 m² (roofed), further balcony 5 m² (roofed), furnishing provided, brick barbecue. Pool (private use): 6.0 x 4.0 m, 1.45 m deep, open throughout the entire season. Pool area: tiled, 8 sun loungers, 2 sunshades, external shower. Sports facilities/ leisure time: private use (free of charge): table football, children's playing equipment. ● Distances: Center Porec in approx. 15 km. Vrsar in approx. 9 km. Rovinj in approx. 23 km. Next shopping possibility (Sveti Lovrec) in approx. 4 km. Next supermarket (Vrsar) in approx. 9 km. Airport Pula in approx. 43 km. Harbour/marina Vrsar in approx. 9 km. Sea in approx. 9 km. Rocky beach in approx. 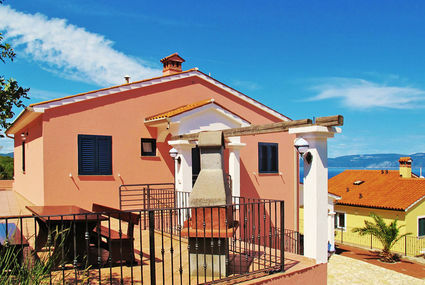 9 km (Vrsar). Situation: in the hamlet Cerjani, rural. Access/parking: parking on the estate. Estate (private use): approx. 1500 m², closed plot (fence, wall, entrance gate), lawn, olive trees. Outdoor facilities(private use): terrace 20 m² (roofed), reserved open space, furnishing provided, sunshade, transportable barbecue, summer kitchen (dining area, hob). Sports facilities/ leisure time: private use (free of charge): children's playing equipment. ● Distances: Center Kastelir in approx. 3 km. Porec in approx. 13 km. Next shopping possibility in approx. 3 km. Next supermarket in approx. 4 km. Airport Pula in approx. 63 km. Harbour/marina Porec in approx. 13 km. Sea in approx. 13 km. Pebble beach in approx. 13 km (Porec). Situation: in the village Ravni, sea view. Access/parking: 3 x parking on the estate. Estate (private use): approx. 500 m², partially self-contained (fence, hedge), in a hillside, with plants, flagged floor. Outdoor facilities(private use): terrace 40 m², further terrace 20 m², further terrace, balcony (roofed), furnishing provided, 4 sun loungers, sunshades, transportable barbecue, brick barbecue. ● Distances: Center Labin in approx. 12 km. Rabac in approx. 17 km. Next shopping possibility (Ravni) in approx. 400 m. Next supermarket (Labin) in approx. 12 km. Airport Pula in approx. 51 km. Harbour/marina Rabac in approx. 17 km. Sea in approx. 1 km. Rocky beach in approx. 1 km.